The production of meat requires a multiple of the land area, which requires the production of plant foods, because in the production of meat always first plants must be grown as feed, which are then fed. And only a small part of the feed is converted into meat, milk or eggs. More than 70% of the Swiss agricultural land is used for animal feed. At least half of the area used could easily be grown vegetables, fruits or cereals. On the area of a property needed to produce one kilo of meat 200 kg of tomatoes or 160 kg of potatoes could be harvested during the same period. 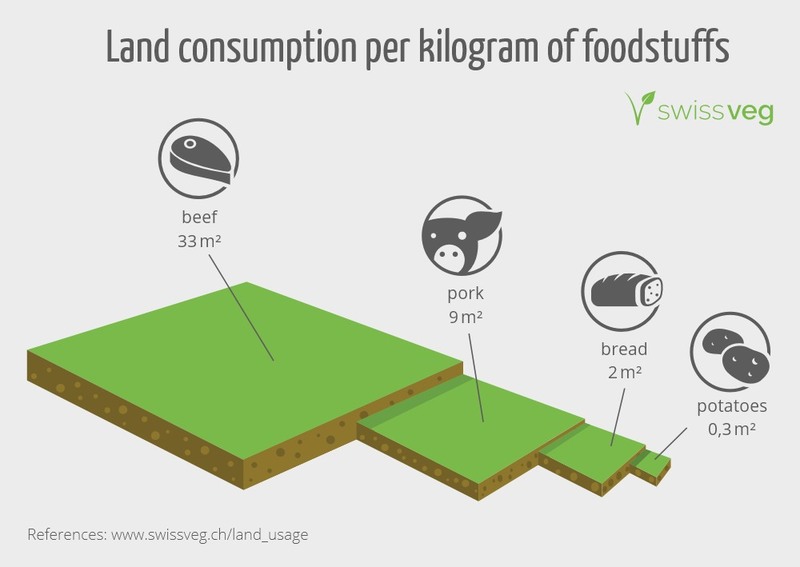 This immense land consumption is mainly due to feed production: in Switzerland, nearly three-quarters of the agricultural land is devoted to animal feed. To produce 1 kg of meat, 7-16 kg of grain or soybeans are needed. When "converting" grain into meat, among other things 90% protein, 99% carbohydrates and 100% fibers are lost. 57% of Swiss grain are fed to animals (1990). Following this table, the ratio between steak and carrot can be calulated on the same piece of land. 50 kg beef corresponds to 250 steaks à 200 g. 6000 kg carrots correspond to 96618 pieces à 62.1 g2. A steak needs the same amount of acreage as 386.5 carrots. Analogously, these would be 88 apples (à 182 g) and 267 cherries (à 15 g). EarthSave Foundation, depending on the cultivation or rearing method, the values ​​may vary. This average weight for carrots comes from the document «Mittlere Gewichte einzelner Obst- und Gemüseerzeugnisse» of the German Federal Office for Consumer Protection and Food Safety.